Unlike the storebought version, these Healthy Homemade Peanut Butter and Jelly Uncrustables are all natural and whole grain with no sugar added! PB&Js and I go way back… probably from before I was born! I blame my peanut butter obsession on my mom. I wonder if she ate PB&Js when she was pregnant with me? I mean, she did tell me she ate three chocolate bars a day when I was in her tummy, which definitely explains my chocolate addiction). I even remember buying Uncrustables from the store when I was only six years old. I was the pickiest eater and hated bread crusts, so they seemed like the perfect solution. Aka, mom hears less whining from me. BREAD: UNBLEACHED WHOLE WHEAT FLOUR, WATER, WHEAT GLUTEN, HIGH FRUCTOSE CORN SYRUP, PARTIALLY HYDROGENATED SOYBEAN OIL, SALT, YEAST, DOUGH CONDITIONERS (DISTILLED MONOGLYCERIDES, SODIUM STEAROYL LACTYLATE, DATEM, ENZYMES [AMYLASE, LIPASE, ASCORBIC ACID, CALCIUM PEROXIDE, AZODICARBONAMIDE, WHEAT STARCH]. PEANUT BUTTER: PEANUTS, DEXTROSE, SUGAR, CONTAINS 2% OR LESS OF: PARTIALLY AND FULLY HYDROGENATED VEGETABLE OILS, SALT, MOLASSES, MONO AND DIGLYCERIDES (PALM AND/OR SOYBEAN OILS). STRAWBERRY JAM: STRAWBERRIES, HIGH FRUCTOSE CORN SYRUP, CORN SYRUP, SUGAR, CONTAINS 2% OR LESS OF: PECTIN, CITRIC ACID, POTASSIUM SORBATE (PRESERVATIVE). Why buy from the store if you can make an exact duplicate in as little as two minutes? Spread the peanut butter in a circular fashion in the center of five slices of bread. Spread the fruit spread in a circular fashion on top of the peanut butter. Use however much you want. If you want more peanut butter, use more peanut butter, if you want more jam, use more jam! Place the remaining slices of bread on top of the coated slices. Put the pastry press (try this one or this one!) over the center mound and firmly press down to seal. Enjoy immediately, or place in sandwich baggies and freeze for later! TADA! 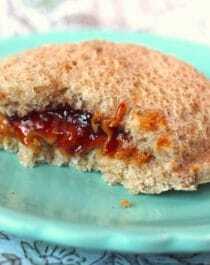 A healthy, fresh, homemade crustless PB&J sandwich without the harmful ingredients! And because these Healthy Homemade Peanut Butter and Jelly Uncrustables are so much fun to make, I made a little stop-motion video for y’all. Hope you like it! I love this!!!! I dont have that particular press, but I do have the one for pop tarts also by Williams Sanoma. Do u think that would work? That will definitely work and it will be just as adorable! And then I can freeze them! Because I am a weirdo and eat uncrustables frozen….. I like uncrustables frozen because the peanut butter is hard and breaks off like a chocolate bar. But I have not been able to duplicate this by freezing a PB&J. the peanut butter doesn’t get hard in the freezer.. it just gets really cold. so cute! I love pb&j! First of all, wait, what? a pb&j recipe? lol I didn’t think you needed a recipe. Second, are you telling me that someone sells crustless pb&j sandwiches? People are so busy that they cannot make a pb&j sandwhich? Wow! Does anyone know the name of that pastry press?